FBI Investigating Flint Airport Stabbing As Possible Act Of Terrorism : The Two-Way The FBI identified the assailant as Amor Ftouhi of Quebec. He reportedly yelled "Allahu Akbar," or "God is great," before stabbing an airport police officer in the neck Wednesday in Flint, Mich. The FBI is investigating Wednesday's stabbing of a police officer at the Flint, Mich., international airport as a possible act of terrorism, the agency says. 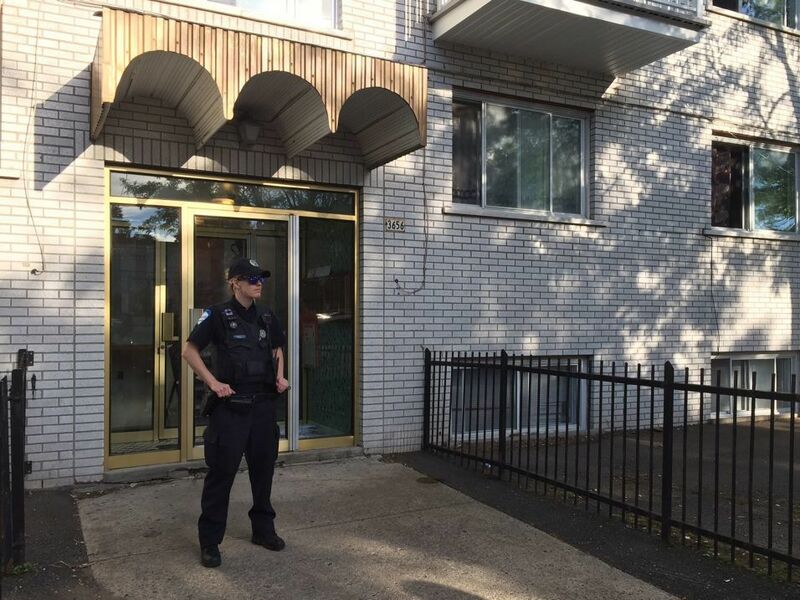 A police officer in Montreal guards the front of an apartment building, where Amor Ftouhi lived before traveling to the U.S. earlier this month. Ftouhi, a Canadian resident, is suspected of stabbing an airport police officer in Flint, Mich., on Wednesday. The FBI said it is investigating it as an "act of terrorism." The assailant has been identified as Amor M. Ftouhi of Quebec. He allegedly stabbed a uniformed police officer in the neck Wednesday morning at Bishop International Airport, prompting an evacuation and shutdown of the airport. Lt. Jeff Neville was in satisfactory condition after being upgraded from critical, airport police chief Chris Miller said at a late afternoon news conference. Neville is with the Bishop Airport Authority. Ftouhi, 49, referenced killings in Syria, Iraq and Afghanistan and yelled "Allahu Akbar," or "God is great," before attacking Neville, according to a statement issued by the U.S. Attorney in the Eastern District of Michigan. FBI Special Agent in Charge David Gelios said that while the attack is being investigated as an act of terrorism, officials have no information about a"wider plot." Ftouhi is charged with committing an act of violence at an airport, which carries a maximum penalty of up to 20 years in prison. Airport chief Miller said that even after being stabbed, Neville fought with Ftouhi before other officers intervened to help. According to the criminal complaint filed after the attack, Ftouhi allegedly asked one officer "why he did not kill him." Officials quoted by The Washington Post say Ftouhi entered the United States from Canada on June 16, in New York, before arriving in Flint. After the attack, the city of Flint was put on alert. Michigan Radio reports that there were extra police officers stationed around City Hall. And Flint Mayor Karen Weaver said in a statement "that several agencies are involved and working to ensure the situation is under control. However, at this time we are taking extra precautions just to be safe." WDIV reports the airport reopened at 4:15 p.m. local time Wednesday. The airport asked travelers to check with their airline – not the airport's website –regarding the status of flights. The White House said Wednesday that Homeland Security Adviser Tom Bossert briefed President Trump on the stabbing.